What I regret most in my life are failures of kindness. Those moments when another human being was there, in front of me, suffering, and I responded ... sensibly. Reservedly. Mildly. Or, to look at it from the other end of the telescope: Who, in your life, do you remember most fondly, with the most undeniable feelings of warmth? Those who were kindest to you, I bet. It’s a little facile, maybe, and certainly hard to implement, but I’d say, as a goal in life, you could do worse than: Try to be kinder. Here’s what I think: Each of us is born with a series of built-in confusions that are probably somehow Darwinian. These are: (1) we’re central to the universe (that is, our personal story is the main and most interesting story, the only story, really); (2) we’re separate from the universe (there’s US and them, out there, all that other junk – dogs and swing-sets, and the State of Nebraska and low-hanging clouds and, you know, other people), and (3) we’re permanent (death is real, o.k., sure – for you, but not for me). Well, yes, good question. Unfortunately, I only have three minutes left. So let me just say this. There are ways. You already know that because, in your life, there have been High Kindness periods and Low Kindness periods, and you know what inclined you toward the former and away from the latter. Education is good; immersing ourselves in a work of art: good; prayer is good; meditation’s good; a frank talk with a dear friend; establishing ourselves in some kind of spiritual tradition — recognizing that there have been countless really smart people before us who have asked these same questions and left behind answers for us. Because kindness, it turns out, is hard — it starts out all rainbows and puppy dogs, and expands to include . . . well, everything. Commencement speech given by author George Saunders at Syracuse. Seed questions for reflection: How do you relate to the notion that kindness includes everything? Can you share a personal story where you found your notion of kindness expanding counterintuitively? What practice has been helped you root yourself in kindness? Kindness cannot be feigned, nor is it an intellectual exercise or a mental choice. Kindness is fragrance of the soul ; can a flower that has no fragrance, ever spread it ? Real kindness naturally happens in our conduct towards others when we feel kind and soft within. When do we do that ? When we have a feeling of abundance of joy. When we connect to our soul, that occurs effortlessly. It is ego that hardens us with limited and limiting consciousness of Me, My and Mine. The soul indeed has an abundance of joy, but we - our ruling consciousness, our mind - must connect to it. Meditation is the best way, but it is more than just a technique of sitting with eyes closed. The way we live between two meditations, is decisive of their quality or their depth. So right living is another thing that is important. The Biblical Ten Commandments, the Yama-Niyama in Raja Yoga and the essential teachings of all faiths guide us towards right living. Small acts in daily life matter. A third point is good company. No matter how much we may will, bad company can weaken us and take us astray. Company of good thoughts, good people, good books can make a difference. Gradually, we learn to care - in small things, even when nobody watches. Our ego gets purified, the consciousness, or the sense of belonging, expands. The joy of living deepens, you feel connected to all beings and things. That's when kindness happens. Effortlessly. Each day I read this quote from the Dalai Lama: "Be kind whenever possible. It is always possible" I don't do it perfectly, but it helps me be aware of how important, and often, really how easy is is to be kind instead of irritated or grumpy or frustrated...and the bonus is I feel better too. For me, it needs to be a daily practice and each time I forget, I have the option to make amends or "pay it forward" It's a gift to be kind. I completely agree !!! I will look for places today where I can be kind ,thanks for the reminder. Army of kindness that's great. Listening to a friend the other day I chose to hear him without placing judgments on what he was saying. I heard him without agreeing or disagreeing. I just listened. In the end, I felt much more respect for my friend as well as for myself. My contemplative practices of prayer and meditation have helped me to see where my mind tends to go. As a result I can make a conscious choice to love instead of reacting with my ego. I would say that to kind to others we do not necessarily need to overlook our own needs. On the contrary, to be kind to others, we first need to be kind to ourselves. There are three things that take me from a kindness mode: 1) When I'm in a hurry. My mind becomes preoccupied with my own needs, or rather, wants. This is just me being selfish. 2) When I intellectualize a situation and try to determine if a particular person (or situation) deserves kindness. And then I think who am I to determine whether one deserves or doesn't deserve kindness. This is me being arrogant and judgmental. 3) When I rationalize and create expectations for my kindness. This is my own greed. The gift given to me IS my giving kindness. So, it all boils down to my own issues, not those of others. I need to continue to work on my own internal transformation in order to bring about an external change in my being. Only then will I be able to freely gift kindness to all <3. Thank you for continuing this circle and bringing it online :). As I continue to reflect on kindness, what it means, how we live in kindness, I remember these words that Audrey Hepburn wrote when asked to share her "beauty tips". So beautiful and, to me, paints such a beautiful picture of kindness in all that we are and do. These tips put a smile on my face every time I read them.... I hope they spark a smile on yours! Enjoy!!! Praise and Thankâsgiving to God, in and throughout my day, best roots me in Kindness. Adequate rest, a flowing spirit and submission ( too) aid in the attitude of kindness. When I was a little girl, there was a man in my life (my father) who did not "deserve" (by my little mind's standards) to be treated kindly. In prayer and by way of my spiritual adult mentor, God TOLD me that while I was yet a sinner ( unkind) He GIFTED me ( in kindness) His Son. In this, God told me to do the same with my father. Let your light, love and kindness be a constant to him . . . Period. As He is God (kind) and I am not, when I allowed/allow God's kindness to flow through me, I was able to do what He asked. Love ( be kind) to one another because Love ( kindness) is of God. Amen and amen to The Gift of Christmas. Love you! When I read this writing "Kindness Includes Everything" I thought of a three year old child saying loud and clear, "I am and I am not." There seems to be a living spite at this age, even a malice that begins to loses contact with this inner Essence. And for me personally, because I felt deeply cut off from the Ground of Being in my early years, it now feels like I am seeking this constant support and reinforcement from the Supreme Being. It is as if my beliefs are seeking an agenda and to sustain me in a particular identity. However, because of physical circumstances, I have had to drop my beliefs and even trying to convince myself certain beliefs are true. Faith is becoming the actual support and presence. It is like the direct experience of Essence. Breaking this boundary between what "I am and what I am not" is kindness. This kindness appears to be seeing through this boundary and recognizing the invention within my own mind. Breaking this boundary feels like simply resting in and learning to be one with my true identity. The real clarity is I no longer work at it. I feel like I am learning to surrender into being nothing and paradoxically this is everything. The down fall to this nothingness is it feels like walking off the edge of the world, my end or my death. Faith is all there is to counteract the terror and despair and at the same time it is the starting point where everything begins within this Void. This place to just begin is kindness and maybe this is simplicity itself. It is where there is no artificial manipulation. It is just this place where my response to life and other people is completely sincere, direct, and heartfelt. 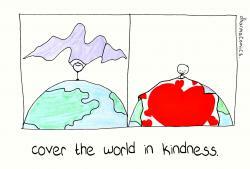 It feels like this kindness is unselfconscious because it is one with the world. Maybe kindness can awaken this innocence, this largeness of heart, where there is no boundaries. And it seems faith, this unshakable confidence, is all that can go here where I am not bound by my beliefs, doubts, and learned procedures. It feels like kindness is truly a clarification of all my boundaries and even seeing through boundaries. This is Essence and is felt with everyone here and truly is the significance of your presence. When kindness and love are the foundation of our interactions, all else seems to fall in to place. I believe whole heartedly that kindness and love must be authentic. And to be able to truly and authentically share kindness and love, I first had to start with myself. Sure, I tried to put forth and I did put forth kind acts toward others but there was always a little something missing… both on the giving and receiving end. When I stepped back to really reflect and focus on first healing myself… being kind to myself and finding the place where I could love the essence of who I am, I found that each act of kindness and each interaction wrapped with love became so much more authentic and complete. I find that giving with pure intentions of kindness and love is really a gift to me as well. It completes the mending of all the tattered and torn parts inside and I know ultimately that is mending tattered or torn parts of what’s around me as well!!!! Many kind wishes of love to all!!!!! One day I was walking down our drive way, it happened to be about a quarter of a mile long at that time, we lived in the country side on the edge of San Jose and the city of Milpitas. Use to be nothing but orchards here as far as they eye could see but we have turned into the present Silicon Valley. In any case I during this particular day I was feeling particularly contemplative and a thought came to me, " I am the space I occupy, I am both space and matter. I am self aware there for space and matter are self aware. This thought lead me to the realization that the Universe is aware by the mere fact that I am a part of it, made of the same stuff and I am self aware therefore I can say the Universe is self aware. Some would call this realization the presence of God. As human beings we have the ability to comprehend and related to the omnipresence of God, the spirit of love and unity, of being related to all there is, life in particular is of interest in this realization I then had a second thought, I asked my self what is love? where does it come from ? Is it outside of me, can it be given, taken, traded like a tangible object?. It was then that I observed a caterpillar worm in the middle of forming a cocoon and there after transform into a butterfly. I thought ahah ! Human beings are born human beings, that is people in the human form but we have the ability to transform and I further realize that, that transformation is innate, inborn, natural. We were made by God to transform into love and that is our natural evolutionary path. If one is in tune, balanced, sober, loving, one not only realized this but accepts it as self evident. Without us transforming into love there is not love we can experience. Yes we can experience other people's kindness toward us but the only way to truly experience love is to be love itself. If you are love itself then kindness is everything, in everything, it is a state of being, No judgment, no selection, and not choice we are simply love and kind because it is our state of being. While reading this piece, three quotes came to mind. Gandhi said his religion is kindness. What better religion could there be? Henry James said, "Three things in human life are important. The first is to be kind. The second is to be kind. The third is to be kind." If we just get one right we'll be in good shape. And Jesus said what you do to the least of people, you do to me. That's a powerful and profound statement. For me, it's true that kindness includes everything, and it's based on our being one, which Jesus knew and stated in various ways. It follows for us to be kind to all things plants, animals, all people, and self. What we do to any we do to all. I don't think it's built in or Darwinian that we're central to the universe, we're separate from the universe, and we're permanent. I think many peoples, including our American Indians, have known otherwise. Actually, my intuition seems to say to be kind, and it's my thinking, my selfishness, my hurry that get in the way of my being kind more often. Knowing that all that is is one and is sacred, reminding myself of that, saying it to myself often helps me root myself in kindness, though the roots are still shallow. Kindness is everything to means realizing we are not separate from each other, none of us can fully exist without each other. We are all interconnected. I believe it's actually quite easy to be kind. It's all those small things that add up. This for me is and has been a lifestyle for so long that it's hard for me to identify "moments" of kindness because it's simply how I live each day to the best of my ability. Whether it is doing the dishes or finishing and folding the laundry for my elderly housemates (lovingly referred to as The Golden Girls), leaving the close up parking spaces for people who really need them, giving someone the extra cash they need in line at the grocery story, sharing bubbles with strangers on public transportation to make them smile, hugging homeless people and sharing conversation, etc. What has helped keep me rooted in kindness is to see the other in myself and myself in the other and to realize there is no other. <3 And also to think, how would I feel if I was in that person's shoes right now? How would I want to be treated or spoken to? And the kindness comes back around. Just last week, I learned my Dad's real story and in learning about who he really was, not the failure people thought of but a man with a 140+ IQ who had served in secret operations and was forbidden to speak his truth. That secrecy killed him. He attempted suicide several times & died when I was 22 never having the chance to say who he really was. (that's a whole nother story) As you can imagine learning these details was difficult, though also heart/mind/soul expanding. I was feeling emotionally raw. A new friend, busy with his own work & PhD applications dropped everything and at 1130 at night came over to my house to sit and listen and hug me. (I've recently relocated to Washington DC and have some friends, but am still creating my support system) I cannot even describe how much his kindness helped. With his loving heart I was able to fully process the experience of learning about my Dad. This is all to say, yes, be kind. It includes Everything. Hugs from my heart to yours!